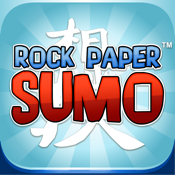 Play Rock Paper Sumo and get the chance to win the £100,000 jackpot! Compete in a tale of conquest, courage, determination, and…sushi! Luck and strategy are your greatest weapons. Use them to sumo your way through crazy rock-paper-scissors battles in an epic quest of casual proportions! Bet on the Victory Wheel and win real money! Discover a fantastic, twisted alternate feudal Japan as you fight your way in and out of absurd situations and battle zany villains. Gain levels and equip wacky gear to become stronger and stronger, and eventually reach a level of sumo greatness most wrestlers only ever aspire to. • Spin the Victory Wheel! Fight more foes than you can shake a chopstick at as you test your luck across feudal Japan for real rewards! Please note: some portions of this game have REAL MONEY GAMBLING FUNCTIONALITY POWERED BY BETABLE. The real-money gambling functionality of this application is only available to customers over the age of 18. A valid Betable account is required in order to use the real-money functionality of this application. Betable is licensed by the United Kingdom Gambling Commission to offer remote gambling services, license number 000­023328­R­307313­003.